The TEW-684UB is a miniature of the TEW-687GA. It is roughly 1/4th the size of the original while maintaining the same shape. The front has the same LEDs with the exception of the LAN connectivity one. The top has a button (although this is not reset but WPS). 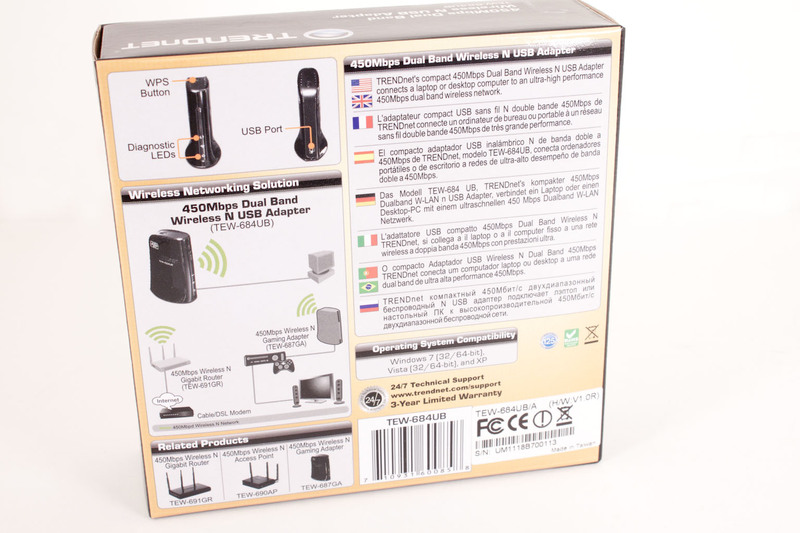 The back has a single Micro USB port for connection to your PC. Pretty simple huh? Well we could not resist and pulled the cover off of this one too. Under the stoic black cover we found a fairly simple PCB with a covered chipset. Unfortunately pulling that cover off had too great a potential for damaging the PCB so we could not discover what was under the hood. We did find something interesting though. If you look just above the EMI (ElectroMagnetic Interference) shield we see three points. These combine to make up the MIMO antenna. The cool thing is that you can attach the same thin wire antenna cables used in laptops to extend the reception range on this. We happen to have a couple from our Minix system and may see what we can get if we connect them to this in the future. For now we will move on to seeing if the performance of the TEW-684UB is also a miniature of the 687GA. 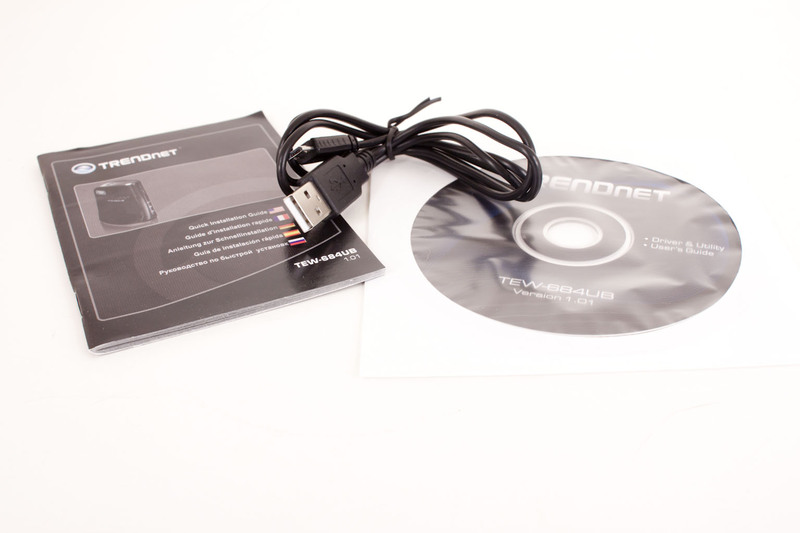 To setup the TEW-684UB it is really as simple as dropping in the CD-ROM and plugging in the 684UB. 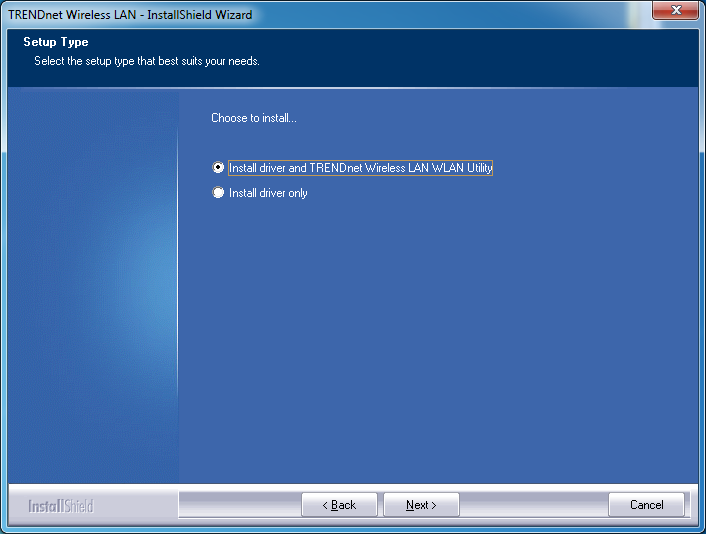 From there you run the very simple installation wizard and you are ready to go. Well, you do have one question you have to contend with. 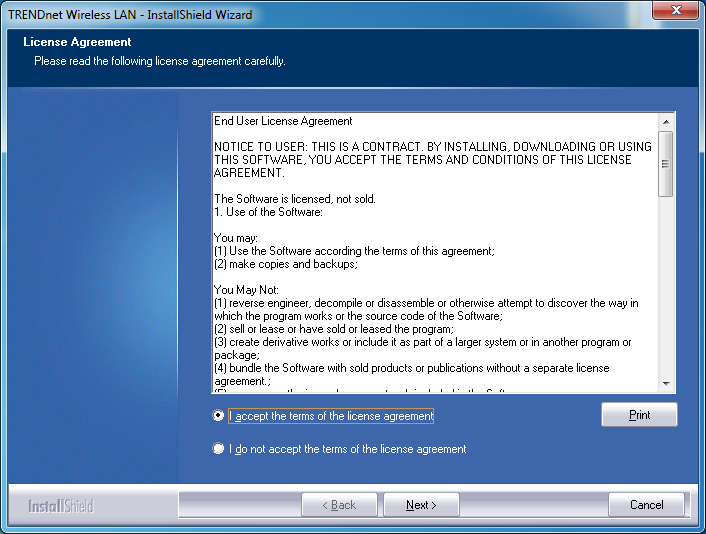 You have to answer if you want to install the drivers only or the driver and the WiFi utility. We will cover the installation with the WiFi utility. Once you get into the utility you will quickly find that while it is very simple looking at first glance; it is quite full featured once you get everything going. Connecting to a wireless access point is really as simple as picking it out in the site survey and then clicking next a couple of times (and putting in the WPA or WEP Key if needed). As you can see it really is quite functional, you just do not have to have all of it at once. We have said it before and we will say it again; you cannot count performance by numbers alone. We will always give you both the raw numbers as well as the other items that make up for how well (or not so well) a product works. These are items like how quickly a USB adapter can initialize once it is plugged in. How quickly does it connect? We took a look at all of these for the TEW-687GA and now we will cover them for the TEW-684UB. For testing we used both a TEW-691GR 450Mbps wireless router (Single Band) and a TEW-673GRU Dual Band (Concurrent) 300Mbps router. We connected to these at 10-feet, 45-feet, and 50-feet. The 10 and 45 foot tests were inside the house proper and the 50 foot test was outside through the Cinder Block walls. 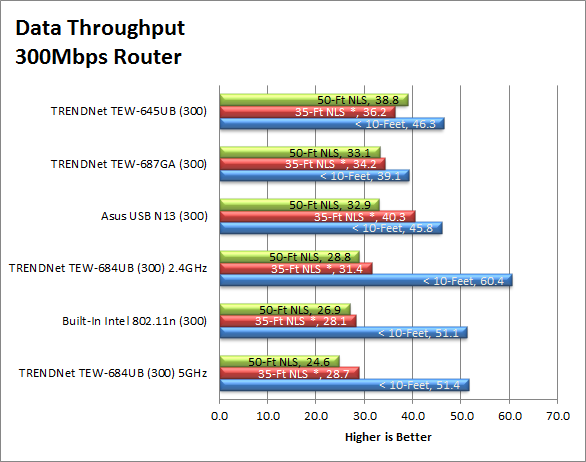 We ran our tests in three different modes 300Mbps @ 2.4Ghz, 300Mbps @ 5GHz, and 450Mbps @ 2.4GHz. At the time of this writing we did not have a dual band 450Mbps router so we could not test at this speed and band. 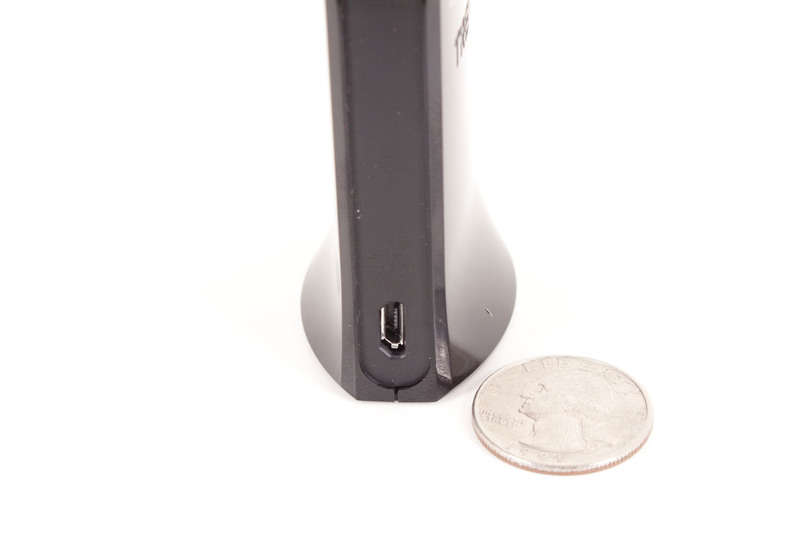 With the three tiny antenna points inside the plastic shell we were concerned with the range a reception of the 684UB. It is not secret that the speed of any wireless device depends on the reception. You could have the fastest adapter on the planet but it will count for nothing if the reception is poor. With the 684UB running on the 2.4GHz band we found that as long as we had no more than one internal wall between us and the TEW-691GR we were able to maintain good reception out to about 35 feet. After that and with more than one wall, or with a single wet wall (a wall with plumbing inside it) the reception dropped off quickly. 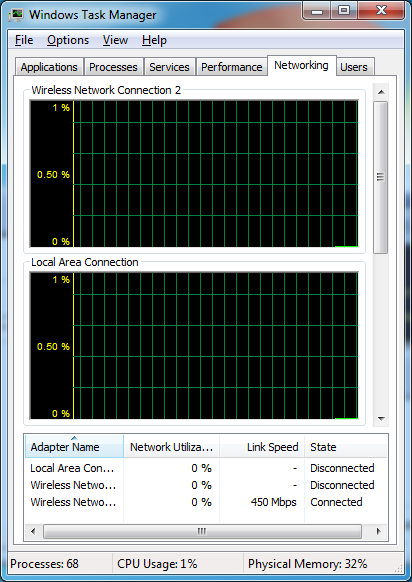 The 5GHz band had a little better range (about 10 feet) before we started to see the reception and link speed drop off. Inside the 10 foot range the 684UB is just plain fast! We were over 60MBps for each of our three successive test runs for the 450Mbps connection and still quite fast even out to 50-feet. The issue becomes one of range at that point. The three tiny little antenna do a good job, but just not as good as they might with a little more help. I used to use this as a measure of how fast your connection is. However, it seems that many companies have caught on to the fact that if they advertise a 450Mbps device it had better show as one. 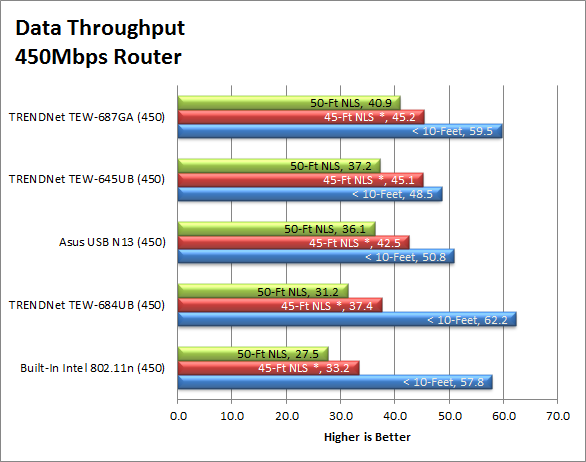 The TEW-684UB shows up as a 450Mbps device when connected to our TEW-691GR. Remember this is typically the full duplex speed and not the half duplex speed of the device. Oddly enough our test results would seem to indicate that we are getting higher than 450Mbps (1MB=8Mb so at 64MBps we are at 512Mbps). So again the listed link speed does not seem to a real indication of speed. When we were within about 20 feet of the TEW-691GR the network was very fast and at times I began to feel like I was connected to the LAN and not over the wireless network. I was able to move files around with ease. I transferred quite a few archived reviews and images (about 15GB) from my EEE Slate back to my networked storage in about 5 minutes. Watching Netflix while doing this present no issues either (except for the limited screen space). On the 300Mbps 2.4GHz network things we pretty quick, but seemed to change speeds quickly. This is more than likely due to all of the interference I get from the multiple access points near me. The 5GHz band was more consistent even if it was a little slower. Although the TEW0684UB is 1/4th the size of the TEW-687GA it is not 1/4th the price. To get this level of performance you are going to shell out $100 before tax and shipping. Is this worth it? Well think about it like this. 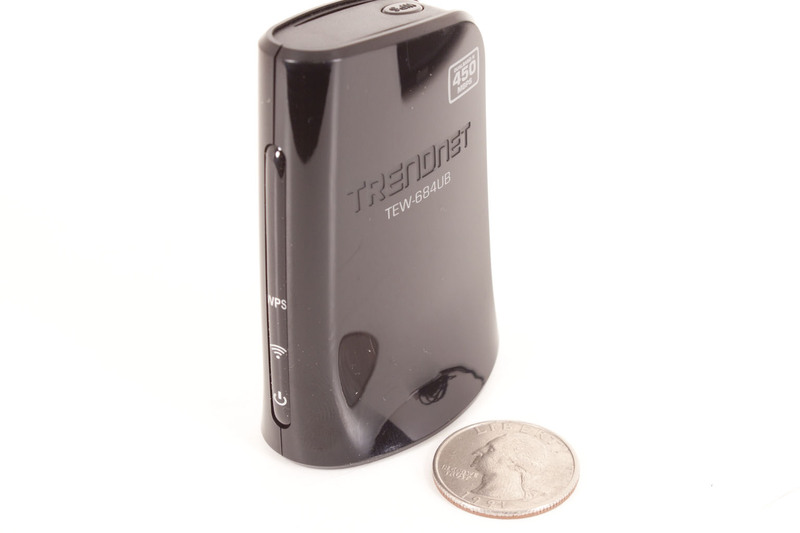 The TEW-684UB is a dual band adapter; this means that it can run in two different modes (2.4GHz and 5GHz). The range is rather cluttered and has a lower penetration rate (shorter range indoors). 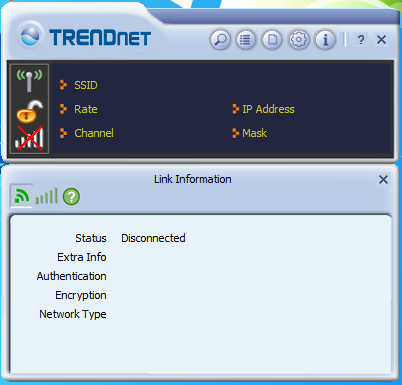 If you live in a wireless “hot” area the chances are there live routers and access points are 2.4GHz, the TEW-684UB gives you the option to setup a wireless network outside the normally cluttered range (with the right router that is). 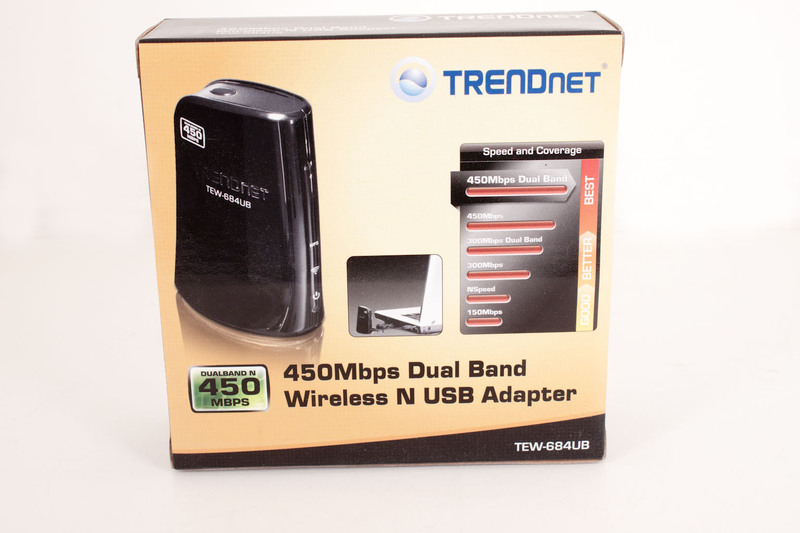 You also have the capability to run at up to 450Mbps (again with the right gear) in both of those bands. In effect you are getting four adapters for the price of one. When you look at it like this, the $100 price tag is not that bad. 450Mbps wireless is on the way. We are seeing new products coming out and they are performing quite well. 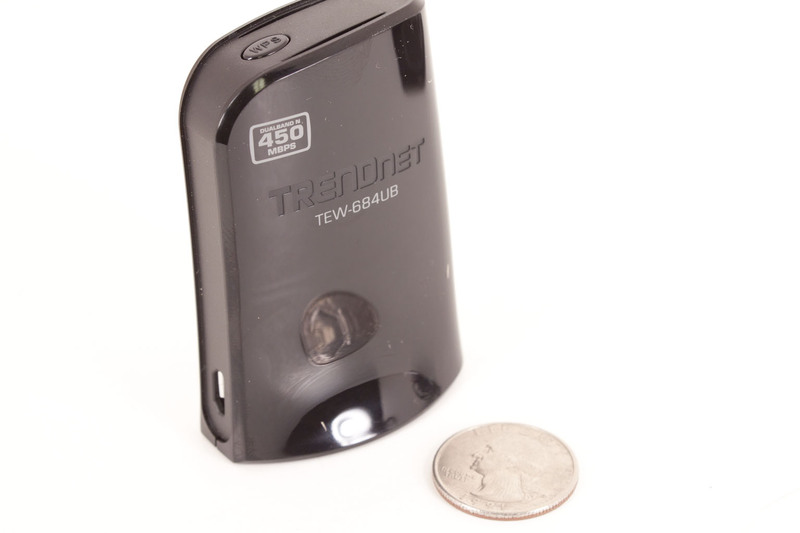 We have already taken a look at two of these from TRENDNet the TEW-691GR and the TEW-687GA, they have shown what you can get from 450Mbps but the 687GA is a little bulky (to put it bluntly). 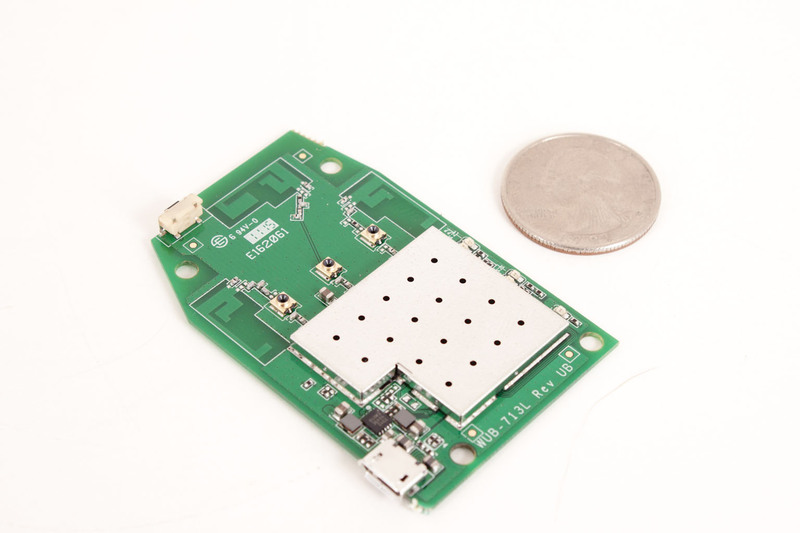 Now with the much smaller TEW-684UB we enter the more mobile market and can see the potential of this new segment of the 802.11n spec. 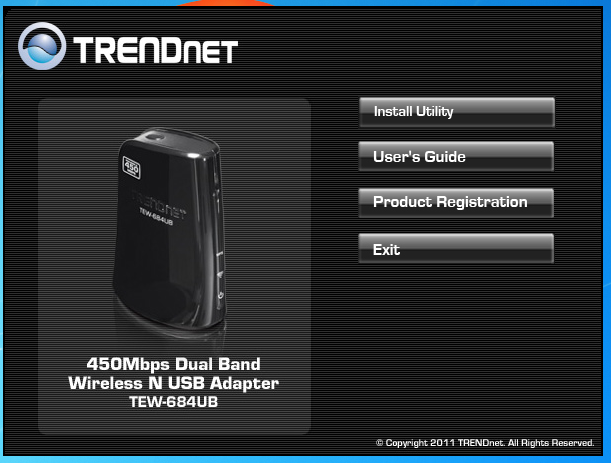 TRENDNet has really put some work and thought into the design of the TEW-684UB. It is a very impressive device. 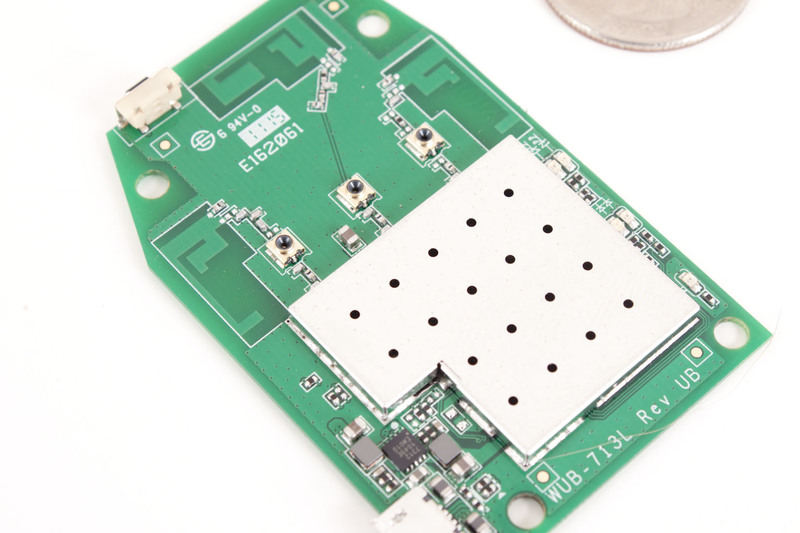 I would like to see a smaller version of this but that will come as the wireless chip makers reduce the size of their designs as well as reduce the power required to run them. 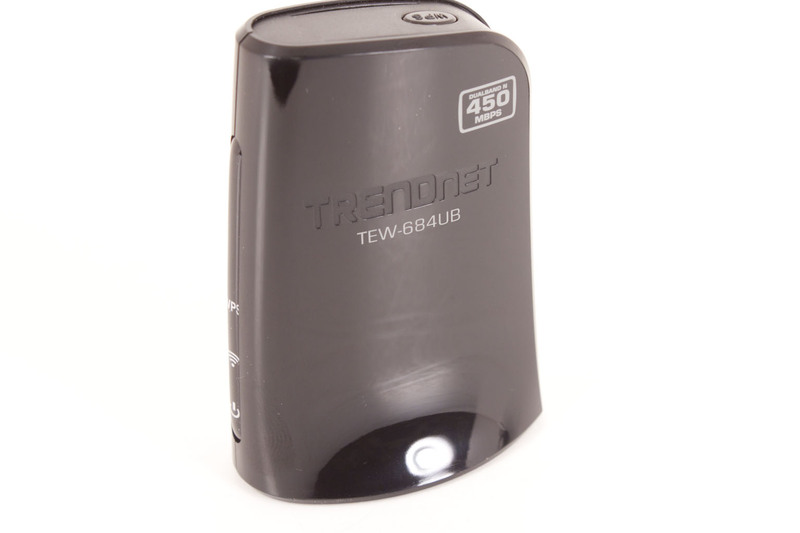 For now if you are looking to make the leap to 450Mbps wireless and need an adapter to complete the package the TEW-684UB would make an excellent choice.